← Featuring Author Jennifer Hinsman on her Blog Tour! 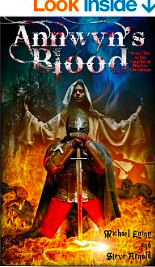 Annwyn’s Blood is a fascinating tale written by Michael Eging and Steve Arnold. It reminded me of a thrilling blend of The Lord of the Rings and King Arthur with beautifully written prose and description that delights the senses. It begins with a gripping prologue depicting two religious novices and great friends, Dylan and Cedric, who wish to serve the Lord, and seek a mysterious and prophetic holy graal. These prior scenes provide a captivating backdrop to the main story. As the central protagonist, Sir Erik of Birkenshire, goes on a quest to seek Marianna, the missing king’s daughter and Erik’s youthful crush, he stumbles upon an overpowering and ancient evil. This takes Erik on a journey of passion and struggle to save his own soul and protect his people from Arawn of Annwyn, the Ruler of the Dead. I think readers will relate to Erik’s interior struggle to do what’s right, while being entertained by a unique story filled with bright imagery that was hard for me to put down! This entry was posted in Uncategorized and tagged #bookreview, #medieval, #writing, action, authors. Bookmark the permalink.